Bipartisan senators and senior former American officials joined Iranian Americans at a Senate briefing to embrace the promise of a free Iran. 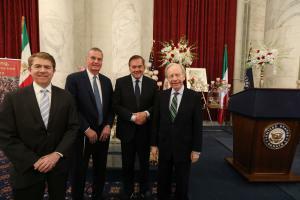 WASHINGTON, DC, USA, March 19, 2019 /EINPresswire.com/ — Bipartisan senators and senior former American officials joined senate staffers and members of the Iranian-American community at a Senate briefing to embrace the promise of a free Iran. 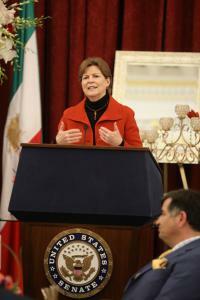 The event, which also included the celebration of the Persian New Year, Nowruz, hosted sitting senators and staff members from both sides of the aisle. Distinguished personalities delivered remarks, including former senator Joseph Lieberman, former National Security Advisor General James Jones, former Homeland Security Secretary Tom Ridge and former Assistant Secretary of State Lincoln Bloomfield, Jr. The Senate event championed powerful backing for the uprising of the Iranian people against the clerical regime and expressed continued support for the organized democratic movement, the National Council of Resistance of Iran (NCRI) and the ten-point Plan of NCRI’s president-elect, Mrs. Maryam Rajavi. Senator John Boozman (R-AR), Chairman of the sub-committee of Military Construction, Veterans Affairs, and Related Agencies of the Appropriation Committee, and Senator Jeanne Shaheen (D-NH), a member of the Foreign Relations and Armed Services committees, were on hand to offer the Senate's bipartisan support for human rights and democracy in Iran. “I have been privileged to meet with family members whose spouses, children, friends are among the 120,000 Iranian citizens who’ve been executed since the mullahs took over,” Secretary Ridge added. “For over 50 years since the MEK was a secret student society, they have said “No” to tyranny, first under the Shah with his brutal SAVAK secret service, and then under the Ayatollahs,” added Ambassador Bloomfield. 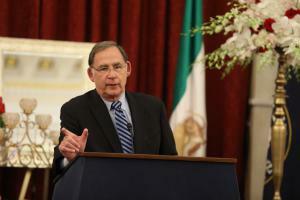 Senator John Boozman spoke to the Iranian-American community and said: "There’s no substitute for you all being up here talking about how important the issue is and how we need to move forward, and it’s a real honor."